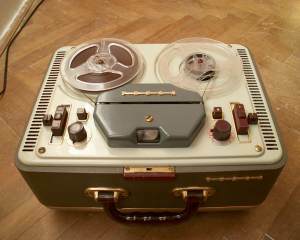 Description: Mono tape recorder with 2 tracks, 1 speed (9,53 cm/s), frequency characteristic 50-10000Hz. Tube record level indicator, pause, play, record, rewind an forward function, tone control. 13cm reels diameter. Wooden cabinet covered by plastic skin, metal panel, transport and bottom cover.